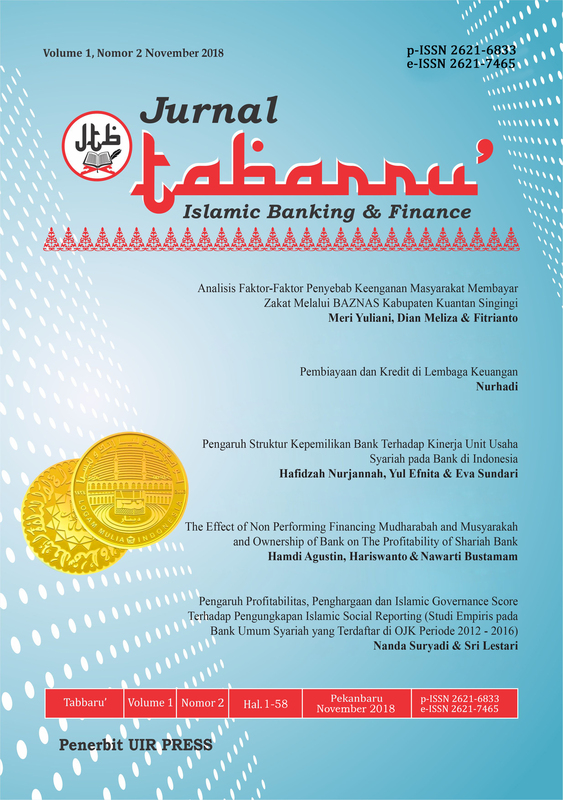 Journal Tabarru': Islamic Banking and Finance (Online ISSN: 1526631753 & Print ISSN: 1527263122) published the original paper or review about Islamic Banking and Finance. Scope and Focus of this journal related to : Islamic Banking (BUS, BPRS & UUS), Islamic Financial Intitutions such as Islamic Insurance (Takaful), Islamic Leasing, Islamic Capital Market (Islamic Bond/SUKUK & Islamic Stock), Islamic Pawn Shop, Baitamall Wattamwil (BMT), Islamic Cooperation, and other Islamic Intitutions,. This journal also cover discussion about Managing Zakat Fund, Managing Waqaf Fund, Islamic Financial Management and Islamic Financial Accounting. We are invited to all researcher, academician, scholar, expert and practicioner to publish their paper/review on Islamic Banking and Finance issue/problem in our journal. Jurnal Tabarru' : Islamic Bangking and Finance is published by Department of Islamic Banking, Faculty of Islamic Studies, Islamic University of Riau.